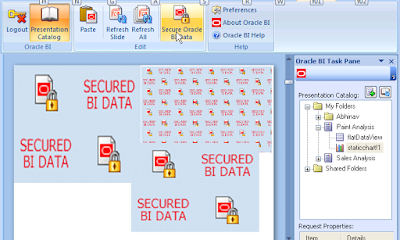 Over the weekend, Oracle Business Intelligence Suite Enterprise Edition, v. 10.1.3.3.1 became available on OTN (that would be the Oracle Technology Network). You can download the Windows (x86) installable here (1.4GB). Downloads for Linux, HP, Solaris, and IBM are also available - see details at the download page here. The documentation library is available online here. And if you care to download the doc library as a zip file for offline viewing, it can be downloaded here (it's a 19MB zip file). Some of the new features for this release are listed in the "New Features Guide", specifically under the 8 General New Features in Release 10.1.3.3.1 and 22 New Features in Release 10.1.3.3.1 chapters. You will now find support for additional languages in BI EE, specifically Arabic, Thai, and Hebrew. 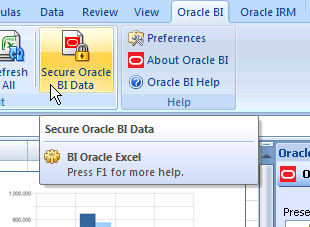 I don't like the image that appears after I have secured BI charts. So you don't like the image and want to change it. Change is good. And you can have it. 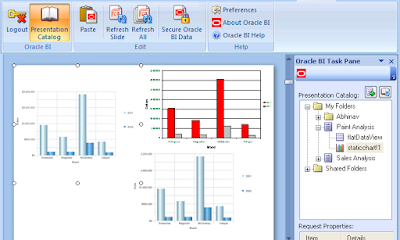 I am talking about Oracle Business Intelligence for Microsoft Office in the 10.1.3.3 release of Oracle Business Intelligence Suite Enterprise Edition. 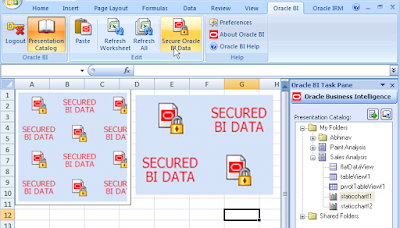 Given a BI chart (specifically, given a chart that has been inserted into Excel or PowerPoint using the Oracle BI Office Add-in)- as a native Office chart, or as a refreshable image, or as a refreshable Flash chart - you can secure it. 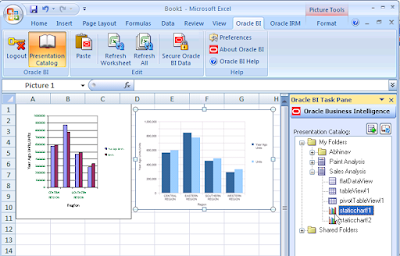 Refresh it and back appears the chart and the data. 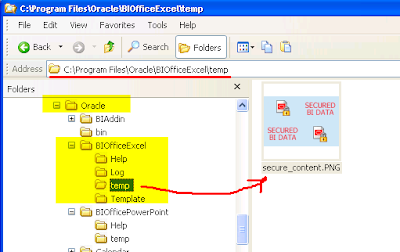 c:\program files\oracle is obviously where you installed BI Office. 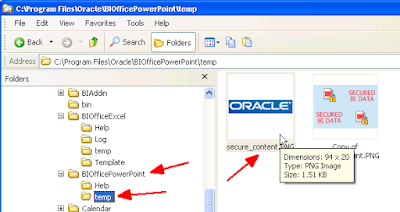 You will see a file named "secure_content.png"
Make a copy of it if you please. And then copy the image of your choice (yeah... we can have the imagination run wild here. But not now) to this folder. 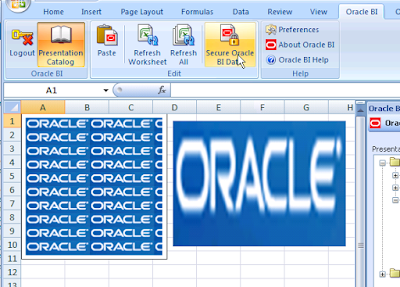 Now go back to Excel. And try the secure operation again. There you go. 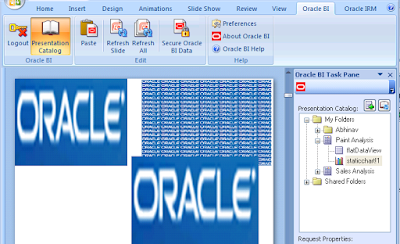 You could do the same with PowerPoint too. 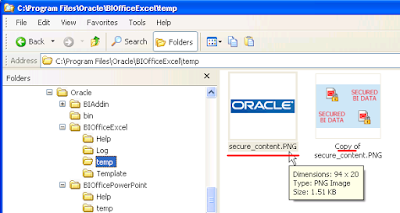 Note that the secure_image.gif file is generated by the Add-in if it is not there - so if you do delete it, then it shouldn't really matter, I think, as it will be regenerated the next time you click the 'Secure Oracle BI Data' button.